Cloud Pepper makes an appearance at AIC. It’s only by having a mind that has access to the correct algorithms and data, and a body that has the agility to replicate human tasks, that robots will become a common occurrence, he said. The trouble is, much like humans, there are physical limitations to the robot ‘body’. However, for robots this is less about wrinkles and stretch marks and more about how much computer power and energy requirements they can accommodate. The solution to this problem is the cloud, said Tang. Why does this matter? Well as developed economies continue to face ageing populations and rising labour costs due to the smaller workforce, robots can provide a cost-effective and efficient solution. So efficient in fact, that humans start to seem like the second-best option. “By moving robot brains into the cloud, they can share information. This means once you have taught one robot, the other 999 can learn the same thing. With humans, if you train one you still have to train the other 999,” explained Tang. Angus Muirhead, Senior Portfolio Manager for Robotics at Credit Suisse, speaks at the AIC. Not that robots are taking over just yet. 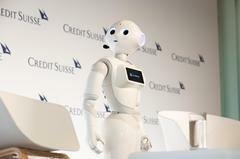 While Tang was joined on stage by a humanoid robot called Cloud Pepper, its activity was limited to answering a few simple questions about Credit Suisse and waving its arms. 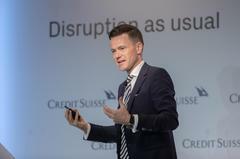 And as Angus Muirhead, Credit Suisse’s Senior Portfolio Manager for Robotics, pointed out, humans have a tendency to overestimate the speed of adoption of technology. So while the media is full of headlines like “robots are coming to take your jobs”, it will still be some time before this becomes a reality. “The problem is, it takes time to build the infrastructure and processes to bring new technology into our daily lives. We are not at the point where we have adapted our processes to accommodate the technology,” Muirhead said. But if the existential questions about robotics don’t pique your interest, then the investment opportunities should. The robotics industry is estimated to generate a CAGR of 23.7% and be worth US$310.7 billion by 2025 – news that’s good for the mind, body and the bottom line.